Meagan earned her Bachelor's in Music Performance at Miami University in 2007 and her Masters in Music Performance at University of South Carolina in 2009. She has been teaching privately and freelancing in the Columbus area for about five years. Meagan regularly performs on viola with professional orchestras, including the Newark Granville Symphony Orchestra, the Mansfield Symphony Orchestra, the Central Ohio Symphony Orchestra, and the McConnell Arts Center Chamber Orchestra. She also plays in small ensembles for weddings, church functions, and other events, and she enjoys playing her 5-string electric violin in a local band. Meagan enjoys sharing her passion for music with her students and helping them master their instruments. She currently teaches violin, viola, and beginner piano at FCMS. Liz Fisher comes from a musical family of 9 and grew up in Delaware, OH. She began playing violin at the age of 3 through the Suzuki Method and also took several years of piano lessons. In 2014, she graduated with a Bachelor’s Degree in Orchestral Performance from The Ohio State University School of Music. In addition to teaching violin lessons, Ms. Fisher enjoys performing at church services, weddings, special occasions, and in ensembles, such as the Central Ohio Symphony Orchestra. In 2017, she completed her teacher training for Suzuki Violin Unit 1. Liz is very passionate about Alternative/Indie genres and Columbus’ local music scene and spends most of her free time performing as the lead-vocalist and guitarist for her Alternative-Rock band, The Cordial Sins. She also enjoys traveling, exploring the outdoors, spending time with friends, family, and her awesome dogs, Charlie and Beck! Mark Gonzalez has been instructing for 17 years and holds a Masters Degree in classical guitar performance and composition. Now in his fifth year with First Choice, he continues to teach a variety of styles and instruments including guitar, piano, bass, and banjo. Originally from California, Mark moved to Columbus after attending California State University, Chico for both undergraduate and graduate degrees. He was awarded Best Guitarist in 2008 by the Chico News and Review. Ted grew up in Worthington, OH and started playing drums at age 8. College took him to California State University, Long Beach where he graduated with a BA in Music. His primary instruments are drums, steel drums, vibraphone and piano. His experience in the Cal State Long Beach Steel Drum Orchestra led him to Trinidad in 2000, where he performed with the band "Starlift" during "Panorama," the country's annual steel drum band competition. He plays styles ranging from Jazz, Rock, Blues, Island, Calypso, Soca, Reggae, Brazilian and New Age. He has been a part of great musical groups such as Utter Space, Cliffside Jam Session, Paul Brown's Science Gravy Orchestra, Ken Messer Phoenix Project, The Procastoenators, Superfez and the Mark Goodwin Quartet. He also leads his own band, Tropical Night, a steel drum Island trio. He sits in with other fine Columbus bands and performs solo. He enjoys performing, composing and teaching. His teaching experiences include teaching drum set lessons at Village Music Haus, in German Village, teaching a kids’ steel drum band/ class at the Whetstone Recreation Center in Columbus, OH from 2004-2006 and teaching at First Choice Music Studio. Vince is a saxophonist, and woodwind instrumentalist based in Columbus, Ohio. 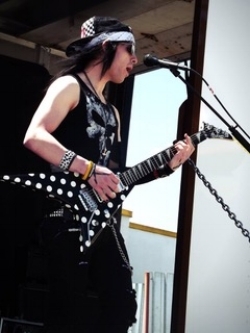 Vince began his study of music in his fifth grade elementary school band program. In high school, Vince was a member of the Columbus Youth Jazz Orchestra and he continues his studies, as he is currently pursuing his undergraduate degree in Music Performance-Jazz Studies at the Ohio State University, studying under Professor Shawn Wallace. Vince has performed in numerous ensembles and musical genres, ranging from jazz, classical, pit orchestra, salsa, blues, funk, gospel, and liturgical. Vince has performed at the Columbus Jazz and Ribs Fest, The Gahanna Creekside Jazz and Blues Festival, The Southern Theatre, The Elmhurst Jazz Festival, and has shared the stage with musicians such as The Columbus Jazz Orchestra, Tia Fuller, Lewis Nash and others. Vince currently performs with the OSU Jazz Ensemble as the lead alto saxophonist, the Art Blakey Combo, the top small group jazz combo at OSU that performs for many university functions and outreach programs, and he frequently subs for the Rick Brunetto Big Band. Vince aspires to work as a performer, teacher, composer, arranger and supporter of music and musical education. Cole received his bachelors degree in guitar from West Liberty University in Wheeling, WV and then went on to receive his master's degree from the prestigious Berklee College of Music. Graduating in May of 2014, Cole also finished with a Pro Tools certification. Cole is well versed in performances from ensemble, solo, and orchestral groups, original and cover bands, as well as solo and duet performances for weddings, banquets, and acoustic nights. Cole’s first love musically is hard rock and metal, but he loves jazz composers such as Barney Kessel, John Pizzarelli, Django Reinhardt, and John Coltrane. In the art music realm he loves composers such as Frederick Chopin, Fernando Sor, Franz Liszt, and Johann Sebastian Bach. Teaching a wide variety of ages, styles, both in public schools and private lessons, Cole continues to practice the craft of teaching music as well as studying music himself. Miss Wendy began teaching violin in 1997 and it’s what she truly loves doing. She has studied violin at Syracuse University, the University of Tennessee and The Ohio State University and completed books 1-4 of Suzuki Teacher Training at The Suzuki Institute at Capital University. Miss Wendy enjoys playing at her church where a year ago they challenged her to give up sheet music and play by ear which has been a challenging but very rewarding experience! When not teaching violin or practicing for church, Miss Wendy enjoys spending time with her family and friends and lives with her son and grandson. Born and raised in the Salt Lake City, Utah area, April Fenn began her musical education with piano lessons at the age of six. Throughout grade school and up through high school, April participated in many recitals and performed with school and church choirs and was a sought after accompanist for many instrumental and vocal groups. April continued her musical studies as an undergraduate piano performance major at the University of Utah on a music scholarship and most recently at The Ohio State University where she earned a Bachelor of Music degree in Piano Performance. April’s past teachers include: Dr. Caroline Hong, Dr. Heather Conner, Stephanie Smith, Dr. Don Massengale, and Bonnie Griffiths. Since moving to Ohio, April has continued her accompanying work in playing for vocalists, chamber music groups, and collegiate symphonies and orchestras. She has taught in her private studio for fifteen years and also plays the organ for her local church congregation. In addition to her musical career, April also has a Bachelor of Arts degree in English Literature and enjoys racquetball, swimming, reading, writing, and spending time with her husband and three young children. Alayne is a recent graduate from Kenyon College with a dual degree in Music and Sociology. She began playing the violin when she was five years old, and hasn’t put it down since. During her college career, she was a founding member of the Chase Quartet, a four-year member of both the Knox County Symphony conducted by Professor Ben Locke, the New Albany Symphony conducted by Luis Biava, as well as a substitute violinist for the Newark-Granville Symphony. Alayne’s solo repertoire, prepared under the instruction of Ariane Sletner, led her to place into the Kenyon College Angela Waite Recital in both 2014 and 2015, and to win first place in the college division of the Knox County Young Musician’s Competition, performing the First Movement of the Sibelius Violin Concerto with the Knox County Symphony in February of 2017. In addition to pursing research on sound and social control as a two-time John W. Adams Summer Socio-Legal Scholar, Alayne has also attended various music festivals during her college career, including the 2014 Philadelphia International Music Festival, and the 2017 Brevard Music Festival and Institute in preparation for a future in violin performance. Upon completion of her Senior Recital and music comprehensive exams, she was awarded Distinction in Music as well as the Thomas B. and Mary M. Greenslade Award in Music Performance. Currently, Alayne resides in Columbus, Ohio working as a freelance musician and arts administrator. Mariam is from the Republic of Georgia where she earned her Bachelor’s degree in Voice (vocal) between 1994-1999 at 1st School of Art in Rustavi. She her Master’s degree in Piano and Voice at Sulkhan-Saba Orbeliani Tbilisi State Pedagogical University of Georgia between 2000-2005. Mariam was performing in Tbilisi’s Opera as a soprano and later worked as a piano and voice teacher in Greece and Germany for 6 years. Mariam has a diverse and rich work experience; in Greece, she worked at the famous music school “Orfeas”. While there, she performed in a Jazz Band in the Saloniki and was the maestro of two kid's choirs. Mariam moved to Ohio in 2014 and continues to work as private piano and voice teacher. She also works as an early learning music teacher at the Arlington Children’s Center to preschooler and school age children. Lisa is a Tubist and Brass teacher in Columbus, Ohio. Lisa begin playing in 6th grade in Lynchburg, Virginia. In high school, she performed at the Music for All National Festival in Indianapolis, Indiana with the Jefferson Forest High School Wind Symphony. This experience made her want to pursue a career in Music Education. Lisa is currently pursuing a Bachelor of Music in Instrumental Music Education in the Conservatory of Music at Capital University. 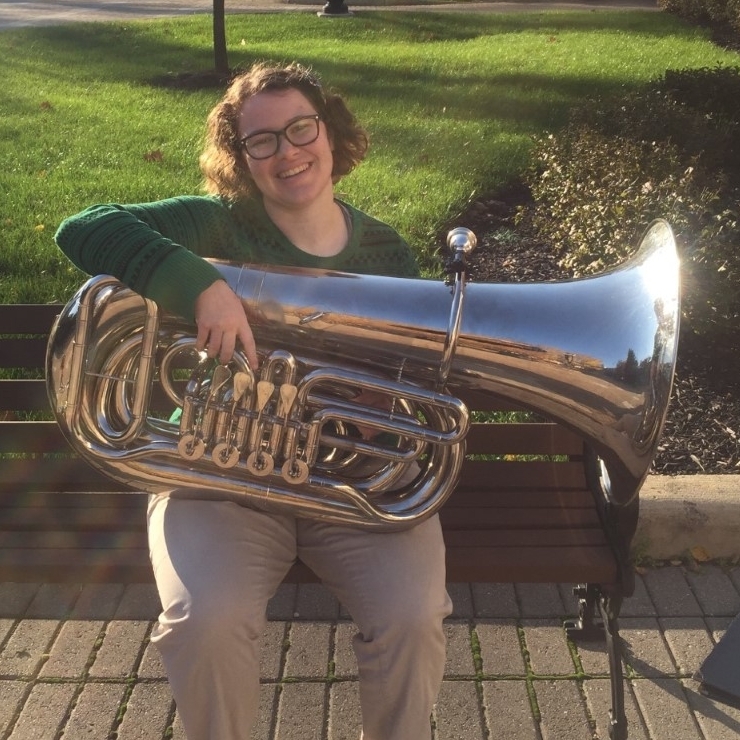 She has played in a variety of ensembles while at Capital including Wind Symphony, Tuba Quartet, Brass Quintet, Tuba/Euphonium Ensemble, and Trombone Choir. Lisa is also involved in the Women’s Chorus at Capital as well as the Hand Bell Choir and the Chancel Choir at Christ Lutheran Church. Nate Newman is a guitarist, performer and educator in the Columbus area. Nate’s first instruments were the clarinet and saxophone, which he played through middle school before becoming wholly dedicated to the guitar. Lyne received her Bachelor of Arts in Music from Susquehanna University in 2016 and her Master of Music degree in Music Performance from Bowling Green State University in 2018. Raised in Northern New Jersey, Ms. Padmore attended performing arts school and performed for the New Jersey School of Dramatic Arts as well as alongside the New Jersey Symphony Orchestra. Although Ms. Padmore is classically-trained, she has extensive experience in other styles, such as jazz, improvisation, and musical theatre. She believes in being a well-rounded musician and encourages musical versatility in all of her students. Bri received her Bachelors degree in Music Therapy and a minor in Psychology from Ohio University in May 2018. Voice was her primary instrument in college, placing an emphasis on musical theatre style. She has been singing and playing piano for 15 years, guitar for 8 years, and ukulele for 4 years. Throughout her high school and college years, Bri was involved in musical theatre, show choir, and dance. She currently volunteers for a non-profit group, The Royals Project, who dress up as superheroes and princesses and visit sick kids in hospitals. In her spare time she enjoys watching crime shows, playing with her cat, spending time with family, and adventuring. Diyora has received her Bachelor's degree in classic and pop music performance from the State Conservatory of Uzbekistan. She started learning piano from music school of Inoyatov, then she went to music college of Niyoziy to continues her musical education. Diyora has 6 years’ experience in teaching piano, and also, she has been involved as a pianist in a kid’s choir. She shares music and musical knowledge with her students. She guides and teaches her students to music theory, aural skills and practical techniques to play the piano. She loves spending her spare time with her family and friends. A native of Columbus, OH, Tirzah started singing at a very early age. Tirzah received her Bachelor’s of Music in Vocal Performance and Pedagogy from Oakwood University in 2014. While in college, she enjoyed singing in with the Aeolians, the premier traveling choir of Oakwood University. Tirzah was able to sing in many different countries with the choir including Wales, England, and Russia. Tirzah developed her love of teaching while at Oakwood and was able to continue training to be an opera singer and voice teacher at Peabody Institute, the School of Music for Johns Hopkins University. Tirzah received her Master of Music in Vocal Performance and Pedagogy from Peabody Institute in 2016. During graduate school, she had the joy of teaching students in the classroom setting and loved her experience. Tirzah loves to perform and has had the opportunity to sing on several stages in the Columbus area. One of her most recent achievements was receiving the Theatre Roundtable Award for Excellence in a Lead Role in a Musical for her performance as Celie in The Color Purple. Tirzah is a member of the choir and praise team at Peace Lutheran Church in Gahanna. She believes that music has the power to change the world. She is excited to share her talents and to inspire students to sing and play! David received a Bachelor’s Degree in Music Education from the Conservatory of Music at Capital University. He has been playing music for the past 12 years and specializes in brass. David also spent the 2017-2018 school year teaching Beginner and Intermediate Orchestra in South Western City School District, and developed a further passion for teaching beginner strings. David is currently a substitute teacher specializing in music in the Worthington City School District. Outside of his professional life, David plays B flat tuba in the Brass Band of Columbus, and is currently teaching himself to play electric bass along to some of his favorite rock artists. He also enjoys cooking, and reading Sci-Fi and Fantasy novels. Emma is currently attending Capital University where she is majoring in Music Performance and a student of Capital’s Conservatory of Music. She has been teaching privately and freelancing in the Columbus area for the past year. Emma is currently a member of the Capital University Orchestra and plays in various ensembles throughout Central Ohio. Emma began playing the cello at 11 years old and was a member of the Columbus Symphony Youth Orchestra while she was in high school, where she had the opportunity to perform at Carnegie Hall. Emma is very passionate about helping students learn instrumental music as well as an overall appreciation for music. Vivian grew up in Pickerington, OH and began piano lessons at the age of 5. She started playing flute in 6th grade band. She continued to take private lessons on both instruments through high school and now college. She participated in many adjudicated events on flute and piano and played in multiple high school honor bands. Vivian currently studies piano performance at The Ohio State University under the instruction of Steven Glaser. She also plays flute in Symphonic Band and performs in collaborative works with other musicians on piano. She believes in helping students find their musical voice and explore all the personalities everyone has to offer in their music playing. Abbey is a music major in her junior year at Mount Vernon Nazarene University. She studies classical saxophone with Dr. Adrienne Lape, and Composition with Dr. Jim Puckett. She plays saxophone, bass guitar, piano, and she sings. She is also a songwriter who writes in contemporary pop, classical, and rock styles. Abbey is involved in the Wind Ensemble and Chamber Winds groups at Mount Vernon. She’s passionate about teaching music and is excited to be a part of the First Choice Music Studio Community.